Once upon a time, there was a website called MapBlast. This was during the wild frontier days of online road maps about ten years ago, when MapQuest was king and Google Maps was but a gleam in the eye of a couple of Danish guys in Australia. MapBlast never seemed to me to be more than a minor player during these days, but it had one special feature that made it my website of choice for route planning: LineDrive directions. LineDrive was developed by Maneesh Agrawala, Chris Stolte, and Christian Chabot at Stanford University, and they describe their system in a 2001 paper if you’re interested in the details. What is most interesting to me is the creators’ inspiration for LineDrive: hand-drawn route maps. While most online mapping services were, and still are, patterned after paper road atlases, LineDrive was designed to look like what you might quickly sketch on a napkin. Grabbed from the above-mentioned paper. Probably not done on an actual napkin. This starting point leads to something quite remarkable. Hand-drawn route maps are custom products — they’re for just a few people, and are about going between one specific place and another. A road atlas, on the other hand, is the same for everyone. It doesn’t change based on the situation. It’s multipurpose, which is quite valuable, but it’s not as effective for a given route as something customized. When the Web came along, the mapping services that came online simply translated the idea of a paper road atlas into its digital equivalent. They added a few enhancements — you could zoom in and out or draw routes on them, but it was fundamentally the same thing. It was still multipurpose, not customized. When mapping services today talk about customization, they mean that you get to draw a blue line on top of their map or add a picture of a pushpin. But the map is always the same for everyone. LineDrive’s most remarkable feature was that it gave everyone their own map, fully customized to their specific situation. It should have been revolutionary, but it turns out that nothing ever came of it, at least in the realm of online driving directions. I did not apprehend the significance of this development at the time. Instead, I merely loved the design. It was brilliant. Clean, simple, effective. It tells you everything you need to know about how to get from A to B, and it tells you nothing else. There is no clutter. It does not take up my time or printer ink with roads I won’t be using, or cities hundreds of miles from those I’ll be passing through. I can look at this map quickly while driving. I don’t have to hunt around the page to find the little blue line that contains the path information I need — everything on this page is there because it’s essential. The LineDrive map shows every detail of the whole route at once by distorting scale. It makes the short legs of the trip look longer, and the long legs shorter, so that everything is visible on the same page at once. With a more traditional road map, either in an atlas or printed off of Google/Bing/etc., I would actually need several maps at different scales to cover each part of the route — zooming in to Madison to show how I get to the highway, then zooming out to show the highway portion of the trip, etc. LineDrive fits everything on the same page, and it does so legibly. Again, it’s customized, which is what gives it value. Since the scale changes, the length of each leg drawn on the map doesn’t correspond to the same distance. Therefore each line is marked with its distance, so you don’t lose that valuable information. In fact, distance is presented more clearly than on a standard road map. If I wanted to figure out how long each leg of my trip was on Google’s map, I’d have to go compare each one to the scale bar in the corner, measuring it out bit by bit. Or, I’d have to check the written directions. It’s not usually presented clearly on the map itself. For me, LineDrive eliminates the need for a verbal listing of directions accompanying the map. They can be clearly read out from the map itself, distances and turn directions and all. This map doesn’t do everything, to be sure. It’s only good for getting from one place to another. It’s very purpose-specific, and there are plenty of things that more standard traditional print and online road maps can do that this can’t. It won’t tell you where the city you’re driving to actually is, or what’s nearby. You can’t deviate from the path, so you can’t react to road closures or changes of plan by switching roads. You don’t know the names of the towns you’ll be passing through. Within its particular niche, though, LineDrive was very, very effective, just like the hand-drawn maps it was inspired by. I have never understood why it did not catch on. Perhaps most people don’t usually use the map to drive the route — the verbal directions tell them where to go more clearly. Perhaps they only have the map to plan routes, not to follow them. The map may be used for reviewing the route before you begin, or re-routing in case of emergency. I’m not sure if any of this is true; it’s just idle speculation. If it is true, though, then LineDrive doesn’t offer any advantages — it doesn’t explain the route any more clearly than verbal directions, and it doesn’t let you do any route planning. Alas, it died too soon. Microsoft bought MapBlast in 2002 and closed them down. They took the LineDrive technology and kept it going on their own map service, MSN Maps & Directions, until 2005. The site stopped updating in 2005, however, and Microsoft’s subsequent mapping endeavors don’t appear to offer LineDrive as an option. You can still access the old 2005 site, however, at http://mapblast.com/DirectionsFind.aspx. (EDIT 10/19/11: Microsoft appears to have finally taken MapBlast offline. Maybe traffic from this post reminded them that they’d left it up.) In generating a sample image for this post, I noticed that the database has quite a few holes and errors in it, so I wouldn’t trust the directions it gives. It’s merely a relic of a different era. If you try it, be sure to check out the standard map directions, too, in addition to the LineDrive ones — it’s a nice reminder of just how far online road map design has come in the past few years. LineDrive was something truly different. MapBlast’s competitors offered a slightly enhanced version of the paper road atlas. MapBlast offered this, too, but they would also give you your own version of a hand-drawn route map for anywhere you wanted to go, at a moment’s notice. I feel like LineDrive made much more effective use of the power computers can bring to cartography than other online mapping services have. It was a more creative re-thinking of what the digital revolution could do for map-making. I never used to draw route maps by hand; I would simply write verbal directions and bring an atlas. Discovering LineDrive changed that, though. Every long and unfamiliar trip since then has started with me taking pen to paper and sketching out a simple linear cartogram to get me where I want to go. Let me tell you about how I was saved by maps. I used to be a chemist some years ago. 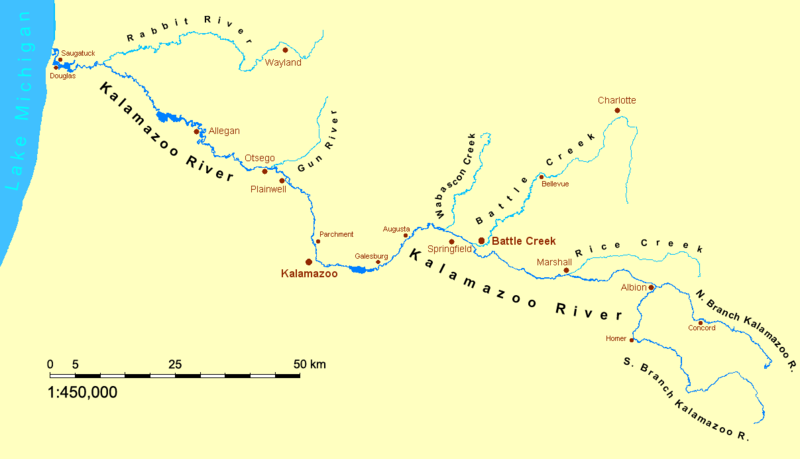 I worked at a mom & pop pharmaceutical laboratory in my home town of Kalamazoo, Michigan. From the time I was ten or eleven, I had planned on this job. I blame Mr. Wizard — I loved watching all the seemingly magic things he could do with brightly-colored liquids in test tubes. Now that I had my childhood dream job, however, I was disillusioned. There was no magic, there was only routine humdrum. The work was hard, it was stressful, and it was frequently dull. I started the slide into depression. I came home every day feeling far too tired for the number of hours I was working. Time off seemed fleeting, and I spent the whole weekend worried about the fact that Monday was approaching, and wondering sometimes if I could face another week. I felt constantly pursued, and unable to relax even when given respite. I decided to get out. I had planned on going to graduate school right after college. I liked being in school and I succeeded there. It seemed natural to continue. But inertia kept me in the workforce for about three years before I finally managed to get enough forward momentum to return to school. My other love in school besides chemistry had been history. I can’t blame Mr. Wizard for this one, but I’ll blame my high school teacher, Mr. Cahow, instead. My bachelor’s degree at Kalamazoo College was in both subjects. At first I tried, and failed, to get in to graduate school to study classical history. The next year, though, I switched focus and applied to History of Science departments. Given my background, it seemed a pretty sensible fit, and the University of Wisconsin agreed. They let me in, and I was off to Madison in the summer of 2007. Coming along with me was my girlfriend of three years, an amazing and brilliant woman whom I had met in college, and with whom I was very much in love. We got a small apartment together about a mile from campus, she found a job, and we settled in to an unfamiliar city. It was about here that my life started completely unravelling. I did not fit in to my new graduate department at all. I was wholly out of my depth; my background was insufficient to match the demands of the program. I had gone to graduate school because I liked school, not because I was deeply passionate about the history of science in particular. It just seemed interesting. My peers, on the other hand, seemingly had been pursuing this track for far longer than I, and had put in enough extracurricular effort through their college years that by the time we all started at Madison they were talking over my head. I fell swiftly behind and lost heart. I realize now that while I might have had the relevant skills, I lacked the critical element of passion. I did not feel like spending all week trying to get through 400+ pages of reading, because the end goal was simply not enticing enough, nor was the journey greatly intriguing. This had been my grand escape plan. My job had depressed me, and I was going to return to school, something I was good at, and I was going to enjoy getting an advanced degree and then spend the rest of my life in academia. My depression returned, much stronger, as this escape plan crumbled away. My girlfriend, meanwhile, made a bunch of new friends in town, and started spending more and more time with them. Sometimes she wouldn’t come home, or even communicate with me, for days. Eventually, she told me that it was because she didn’t like being around me when I was depressed. She kept getting more distant, and moved into her own separate room. She would have parties at our apartment and introduce me as her “roommate,” and then close me off into one room so that I couldn’t hear what was going on, and so that no one could see me. Then she’d leave for a few days and I’d have to clean up the mess. I did not generally have the wherewithal to stand up for myself in the face of her steadily worsening treatment of me. Her behavior eventually reached the point where I started reading online to determine if I was in an emotionally abusive relationship. None of this helped my depression. If you’ve never been depressed, I’ll just say that it’s much worse than it sounds, and I imagine everyone manifests it a bit differently. I would stay in bed for hours. I would avoid doing any of my school work. It took a significant effort to scrape together the energy needed to do any sort of housework or cooking. I was constantly bored, but could not muster myself to do anything to make me less bored, and I did not have the courage to face the growing pile of assignments that I was falling behind on. I felt trapped and powerless. I was terribly proud of that map. I still am, despite the many, many flaws I can see in it today. I kept up my new mapmaking hobby when I moved to Madison. It gave me something creative to do, and I have since learned that, for me, being creative is critical to keeping a positive emotional state. Making maps was the light of my day, in a time when my days were very, very dark. I probably talked more to my colleagues in History of Science about the maps I made than anything actually having to do with my graduate work. I did not construct anything particularly interesting or attractive. Mostly I just put together choropleths of census data to answer idle curiosities. But I was making something, and it felt good. And it involved learning geography, which was fun and new. It was avoidance behavior, to be sure — there were important things I really needed to be doing, and spending eight hours on a map was just a way of procrastinating, but I needed the escape. I could not always face my life outside of my cartographic refuge. I was still trapped in my ill-fitting graduate program. I was adrift, and didn’t know what to do. I did not thrive as a chemist; I did not thrive as a historian of science. What now? I had no other obvious options, and I considered dropping out of school. But one day a friend of mine in the History of Science department pointed out that, being as I liked maps so much, perhaps I could go to school to learn about them. And, it so happened that there was a first-rate cartography program at Wisconsin. I spent my second semester in graduate school taking a cartography and a GIS class while applying for a transfer to the cartography program. I found that I liked these new classes, and that it was no longer a massive chore to get up every day and try and get to campus and accomplish something. I had more energy. I felt like I had a future. Somehow, despite no background or training, despite a weak performance in History of Science, and despite an application letter that didn’t say much more than “I really like maps,” the University of Wisconsin–Madison Department of Geography accepted me, and I began a Master’s program in Cartography & GIS. They took a chance on me, and I cannot hope to repay them for that. I threw away everything I had ever thought I wanted to do with my life and leapt blindly into the unknown. I abandoned the safe, clear path I had been plotting since I was a child. As simple as it sounds, that was probably the most courageous thing I’ve ever done in my life. I thrived immediately in my new program. I found that I was part of something I had lacked before: a community. I was surrounded by supportive friends and colleagues from whom I learned much, and whose input can be seen in everything that I design. I had a place to belong, and a future that I was passionate about. I came out of my depression. I worked up the fortitude to bring about an end to my relationship with my girlfriend, who by now was living on her own yet was unwilling to formally let go. I began to move on from my old life, to the new one I have now. I am a cartographer, and a teacher (another chance that the Geography department took on me). I love what I do. I draw strength from it. It feels like I should have been doing this all along, like I was made for it. I write this story because I want people to understand what maps mean to me. Cartography is not just a hobby, or a job. It has taken me through the darkest times of my life. It has helped me overcome depression. It has given me a renaissance and a calling. It has given me a community which has enriched me personally and professionally. It has saved me from a life I would prefer not to contemplate, one which I cannot believe would be as fulfilling. I am very glad that I made that terrible map for Wikipedia, one winter in 2007.